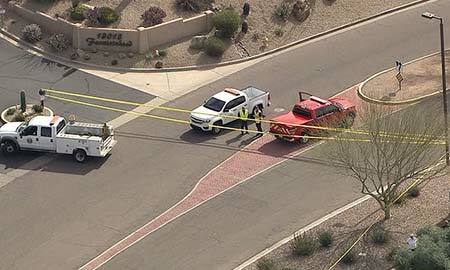 Fountain Hills, Arizona—Three people were killed last week when an SUV jumped the curb and struck two couples on the sidewalk near the landmark fountain in Fountain Hills. One couple, Ronald and Patti Lou Doornbos, both age 60, was from Calgary, Canada. The other couple, Robert Bonta, age 72, and his wife, Karen Bonta, was from Iowa. The two couples did not know one another. Ronald Doornbos, the sole survivor, remains hospitalized in a coma. His wife’s remaining sisters, Rhonda Francis and Terri Dutka, will fly from Canada to Arizona in the coming days to be with him. Ronald and Patti Lou were in town visiting Ronald’s brother and his wife, also from Canada, who were spending the winter in Arizona. The Maricopa County Sheriff’s Office reports that charges are still pending based on the outcome of the ongoing investigation. We extend our condolences to the families and friends of the Bontas and the Doornbos over this tragic loss. We wish Mr. Doornbos a full recovery so he may soon return home.